The bar chart is the most commonly used method for the visual representation of data and key performance indicators (KPIs) in the business world. Bar charts are as commonplace as they are easy to create and interpret. They are a very common sight on performance dashboards including ezzykpi.com. Bar charts group data into bars with lengths proportional to their value. The value being compared could be a number, frequency or any other form of measurement. In a typical bar graph, the X axis represents the groups that are being compared, while the Y axis represents their values. Typically bar charts are used to display simple groupings of data where direct comparison between the values is necessary. A typical user wants to see where their website visitors came from at a glance and a bar chart makes it easy to understand this essential KPI. In technical terms, a bar chart is useful for comparing nominal categories (a group of objects that share a characteristic). That might be population size in specific countries, the source of website visitors or which advertising mechanism brought in a sale. Avoid using a bar graph when comparing objects that have vastly different characteristics. Normally bar charts are drawn with categories along the X and values on the Y. The horizontal chart reverses the axis so the longer the bar is (horizontally), the more value it has. It is often used when displaying categories of data that have long names, because it is easier to format and understand the text. Grouped bar charts be used to contrast sub-groups inside the major groups. For example, you are comparing a KPI like sources of revenue from different stores. Each store might have three ways they sell products — online, in-store and by postal order. A grouped bar chart could display each store with three separate bars that represent their sales methods. 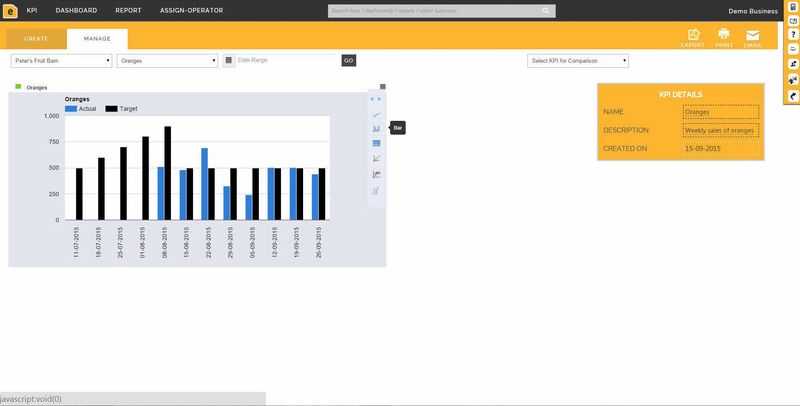 Usually bars of different colours and a legend will be required so the user can quickly understand the different types of values in the KPI being measured. Care needs to be taken to avoid information overload — too many bars and the information is no longer conveyed succinctly. Overuse of grouped bar charts can make interpretation time consuming and should be avoided in such situations. Stacked bar charts are similar to grouped bar charts. However, instead of using multiple bars to represent sub-groups, they incorporate different colours in a single bar to represent each sub-group. This allows the viewer to easily compare the overall values of each group and the sub-groups within each group. While bar charts are very simple to construct and understand, there are a few ways to increase their usefulness when you are presenting valuable information like KPIs. If you have a number of values being compared, it is often useful to include lines that represent the average or mean value. So if you are comparing sales values between stores, you can easily see which stores are above average. Bar charts can be very useful for providing more information from within another chart. If you had a pie chart displaying a KPI like sales, hovering your mouse over a segment could bring up a bar chart which displays how the sales occurred. Most modern KPI Management Software offers the ability to represent data in this way. When using grouped or stacked bar charts, always make sure the sub-groups are relevant to the main groups. Having unrelated data can be distracting or useless for the viewer. Colours are very useful for representing subgroups in stacked bar charts, but they can also be used to represent KPI performance. You can highlight the higher performing categories in different colours and graduate the colours for each bar.